Even though there are currently only 7 programs monitored on DavidNews.com we have another program, which was waiting for a review. Coin Trade Finance LTD joined Golden Stage on DavidNews.com on the 19th of February. This program compared to the previous one is offering investment plans only with withdrawals after a certain number of days – 1, 3, 5 etc. More days – higher interest rates – theoretically higher profit. In total, this HYIP has been online for 17 days. On the 28th of February, it still has status “PAYING” on our monitor. Now I have reinvested in this program $400 and will keep you updated on the payment status. Coin Trade Finance LTD offers 8 different investment plans with deposit term starting from 1 day up to 45 days. For all investment plans deposit is included in the interest rate. 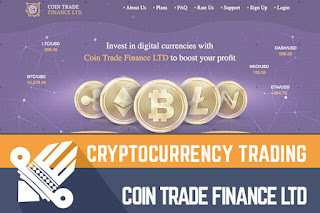 Minimum deposit for Coin Trade Finance LTD investment plans is $25 and maximum $100 000. Interest rates for each plan depend on the deposited amount. Interest rates for three plans with shortest investment terms are as follows: 105% up to 125% after 1 day, 117% up to 190% after 3 days, 135% up to 300% after 5 days. Minimum deposits of $25 in all these plans would have minimum net profit rates: 1 day – 5% net revenue daily, 3 days – 5,7% net revenue daily, 5 days – 7% net revenue daily. Feel free to do your own calculations to understand the real benefit of each investment plan. Moreover, there is also a calculator on the homepage of the Coin Trade Finance LTD website! Admin of the Coin Trade Finance LTD chose the same path as the program I review yesterday by registering UK company for the program. Feel free to check the validity of the company certificate – number, name and address match on the website and Companies House website (service for checking UK registered company information). In the meanwhile, it doesn’t have to do anything with the long-term approach of the program because as we have seen lately both types of programs - with and without registered companies - are collapsing. Coin Trade Finance LTD has a pretty much generic legend, which can be easily replaced and is not memorable at all. However, it’s the story of each cryptocurrency related legend because there is not much to write about. Going into details about trading might not be very interesting for potential investors. Besides that, most of us are interested in investment plans, withdrawal terms, and status of the HYIP on monitors. In fact, there was some complains today on our chat about the withdrawal time of Coin Trade Finance LTD, which according to the FAQ page is 24 business hours. The downside of 24 business hours is that admin can buy 3 full business days before we realize that it has already scammed. In case any of you notice anything unusual about Coin Trade Finance LTD withdrawals, drop a message in the chat box. In the meanwhile, my withdrawal is still being processed, but in the past, it usually took a few hours to receive it. Coin Trade Finance LTD accepts payments from the following systems - PerfectMoney, Payeer, AdvCash, Bitcoin, and Litecoin. As usually, for withdrawals you can use the same wallet as for the deposits. Withdrawals can be requested only after the end of the investment term of the chosen plan. Withdrawal (transaction) fees are applicable only for Bitcoin withdrawals – BTC 0.001. Withdrawals are processed manually and are within 24 business hours. In total there are 8 plans, but I would consider only three of them with the shortest deposit terms of 1, 3 and 5 days. $200 deposit would make a net profit of $10 in the plan “125% after 1 day”, $34 in the plan “190% after 3 days” and $70 “300% after 5 days”. To make these plans comparable we are talking about daily net revenue of $10, $11 and $14. Here we can see that the first plan is still safer because we can request withdrawals every day. Today we are looking at a 2,5 weeks old program with short-term plans. As usual, the downside of such programs is that “all eggs are in one basket” and admin can hardly predict the number of withdrawals, which is more predictable for investment plans where only accruals are withdrawn. Sure, there are some generous programs, which satisfy their investors for some while in both types of HYIP’s. In the meanwhile, website, and program look well. The only question is how long it will last and if the admin will use a joker card with 24 business hour withdrawal time to buy some time when the program is already a scam. However, due to the unpredictable nature of HYIP’s we can’t predict anything. Therefore, if you ever decide to make any investments, don’t invest more than you can afford to lose! Have you already made an investment in Coin Trade Finance LTD and have any useful information to share with us? Please drop a message in the chat box to share your experience! Investment plans: 105% up to 125% after 1 day, 117% up to 190% after 3 days, 135% up to 300% after 5 days, initial deposit included in the payment. Ignore other plans. Join Coin Trade Finance Here!